Nope. Formula One driver Daniel Ricciardo’s Infiniti Red Bull Racing car at least made it to the end this time, but not before the engine exploded into a huge cloud of smoke at the very end. Fellow Renault-powered Red Bull-sponsored team Toro Rosso fared a tad worse, with both cars retiring before the end of the race. Carlos Sainz Jr. retired with a loose wheel, and Max Verstappen came back into the garages during the race with a different technical issue, which wasn’t specified on the telecast. Red Bull teammate Daniil Kvyat, however, made it to the end for a change, unlike last weekend, where his engine blew up at the Chinese Grand Prix. Naturally, the Renault-powered teams have become the most vocal proponents of tweaking the four-engines-per-season limit for this year due to the fragile nature of their power units. 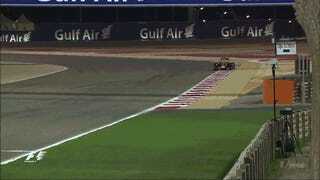 This concludes your Renault Engine Death Watch for the Bahrain Grand Prix.